I'm a sucker for bright colors, and skank shoes. I am scouring everywhere for a good pair of wooden 70's style platforms to be my addiction this spring. Given my budget, these trashy's are (so far) the top contenders. 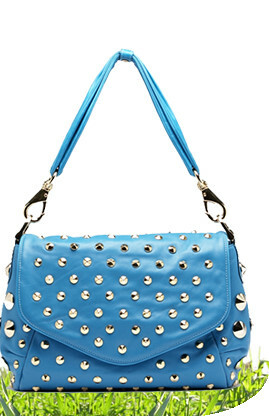 Also, I am still in love with studs, and this Be & D bag in studs and malibu blue is so refreshing to me. 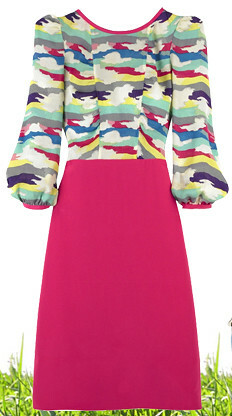 I feel like this post should be retitled 'I WANNA DRESS LIKE MY BARBIE'. For the record, I am not particularly saying I would wear all of these items at once, I just need them all in my possession pronto. Orlando's weather is surprisingly very nice once you ignore the inescapable humidity and muggyness. I definitely packed all the wrong things. Yikes, hopefully I can manage with what I brought. Also for those who asked, I work for a golf merchandising firm as a graphic artist/office manager/sales person/IT person/assistant galore. It's a small company so my role is very versatile and I have many hats to put on during the day.